Most folks are putting away their gardening tools in late fall but don't be so quick to retire inside for the winter. Did you know that winter is the perfect time to prune most deciduous trees? The foliage is gone and the structure of the branches is clearly visible. The tree is dormant, this will eliminate the bleeding of sap from the fresh cuts. In the case of oak trees they should only be pruned during the winter. This is due to the fact that freshly cut oaks emit an odor which attracts the beetle that causes oak wilt. This is a serious disease that often times will kill the tree. The beetles are hibernating during the winter. There are several other varieties of tress that are less likely to contract diseases when pruned during the winter months. Prune locust to prevent stem canker. Prune apple, crab apple, mountain ash, and hawthorn to avoid fire blight. As with any rule there are exceptions to winter pruning. Trees and shrubs that prune in early spring should be pruned immediately after their blooms fade. Some examples of these are chokeberry (Aronia), flowering plum or cherry (Prunus), juneberry (Amelanchier), lilac (Syringa) and deciduous flowering magnolias. 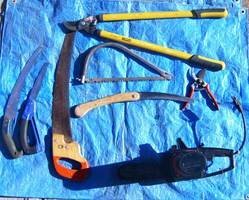 In order to prune a tree or shrub correctly, you need to have the proper equipment. 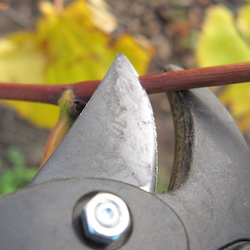 To avoid injury to the tree your pruning tools need to be sharp. Dull cutters leave rough or jagged cuts which are an invitation to insects and disease. Used to remove small branches up to the size of your middle finger. Used to remove branches 2-3 inches in diameter. Specialized saws with widely spaced teeth. Can handle branches up to 5-6 inches. Used to remove larger branches. Available in both gasoline and electric models. 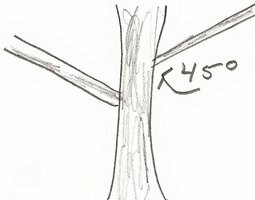 There is a pruning guideline called the “5 D’s” that describes situations where pruning may be done at any time: these 5 D's are dead, dying, diseased, damaged, or deformed branches. The same tree, before and after pruning. 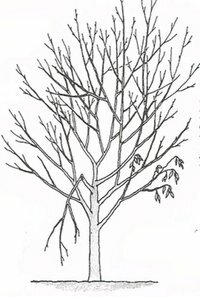 There are two objectives when deciding to prune a shade tree: strength and form. 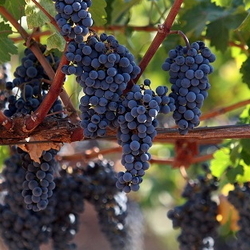 Pruning for strength means to plan to prune so that the limbs and branches are strong and stable. This will eliminate the chances of it being damaged by wind or ice and snow. Small angles and weak limbs need to be removed. Pruning for form means to produce an aesthetically pleasing tree that is balanced and sized for the space it occupies. Look for branches that are rubbing together. Rubbing results in open wounds that will allow insects and diseases access to the tree. Remove one of the rubbing branches. Water sprouts or suckers are found in the interior of the tree as well at the base of the trunk. They grow rapidly and use more of the trees energy than they return. Removing these can be an ongoing process, remove them as they appear. Branch angles are an important factor when pruning for strength. A low angle where the branch meets the trunk is a weak spot. These branches are more susceptible to damage from wind and ice damage. Picture the branch angle as hands on a clock; the ideal angle is a 10 and 2 o’clock configuration or about 45 degrees in relation to the trunk. 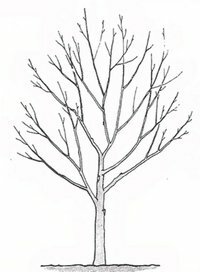 Lateral branches should be no more than ½ to ¾ the diameter of the trunk. Most trees will thrive when some of the interior branches have been removed. This allows for air circulations and additional sunlight to reach the interior of the tree. Leaders are the uppermost branch of the tree that are growing vertically. On new trees you may have to choose from several and choose the most desirable and remove the others. 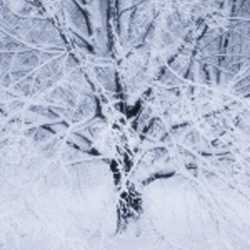 You will also want to remove any branches that are growing inward toward the center of the tree or are growing downward. 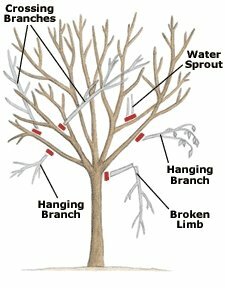 Once you completed the initial pruning is will be easy to keep up with an annual light pruning of the tree. One final note: do not use pruning paint or tar on any pruning cuts. Studies have shown that the tree will do much better if allowed to heal on its own. The only exception to this rule is if you have to prune an oak tree during the spring or summer due to wind damage or other mishap, do apply a pruning paint to those wounds in order to deter insects. Sketches courtesy of University of Florida (UFAS).